I need an East African fix at least once every year, and so a month ago I packed my safari kit and spent ten days driving around some of my favourite places in Kenya. I chose Kenya because I like to support a country that offers so much fun and variety: besides enjoying awesome game-viewing you can gasp at the jaw-dropping scenery, ride on a horse or a camel, walk out with warriors, raft on a tube down a river, get away from the world and then flop on a serene beach – and always staying in places where they have a seemingly innate ability to give you a really good time. This is a perfect place for families because children can see how a real ranch works alongside a game conservancy programme. 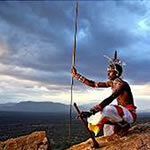 Joseph, a gentle giant of a Samburu who has been on the ranch for 20 years, is the expert guide. The 5 cottages and tented rooms are well spaced along a river and remind me of the accommodation that used to be the norm 10 years ago. 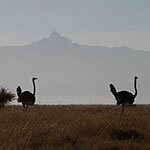 The lodge is below the publicity radar, is located in beautiful scenery with Mount Kenya as a backdrop and, at a price of about £200 per person per night all in, is very good value. Link it with a mobile camel supported safari and perhaps the Masai Mara for guaranteed game sightings. Olerai is another property perfect for families or a group of friends. It is on Tiwi beach south of Mombasa. It boasts one of the best pools I have seen in Kenya; a mature sweep of garden leads down to the beach, and the staff who cook and look after you are delightful. If you take it on a self-catering basis it is inexpensive, and the staff do most of the shopping anyway. Much of what you need can be delivered to your door, whether it is fresh fish or local fruit and veg. The house, which sleeps up to 10, is comfortable and has lots of bathrooms. Atmospheric dinners in the local bat caves are included?. Another house next door can be added for even larger numbers. If you want a day out with some young Kenyan water sports fanatics then I can fix that for you too. 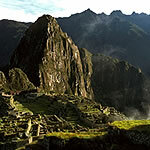 If you fancy a walk to Macchu Picchu, an iconic destination in South America, but not with everyone else, then we can arrange an upmarket walking trail with top guides, local interaction and accommodation in authentic, small lodges. After acclimatising yourself in Cuzco to the high altitudes you can walk through 9 different biospheres and marvel at the beauty of the Salkantay Peak and Humantay Glacier Lake. The trip takes 7 days, and you can walk it or ride it. At the end of each day you stay in really comfy places and can sip a cocktail in a hot tub commanding amazing views of the Andes. April to October is generally the best time to go.